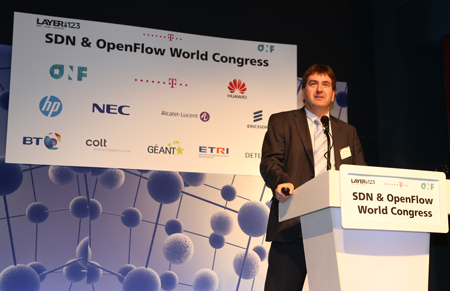 "The fundamental premise of Terastream is simplification," said Axel Clauberg, VP Aggregation, Transport, IP & Fixed Access, Deutsche Telekom AG, speaking at last week's Layer123 conference in Bad Homburg, Germany. 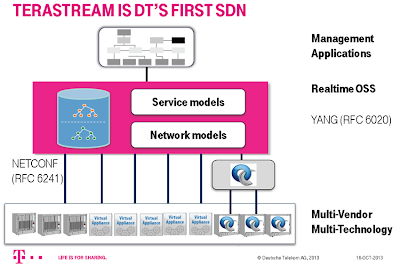 The Terastream project, which is a next generation network project of Deutsche Telekom, in many ways reflects the business drivers and next steps for SDN and NFV. Clauberg said operators must continue to invest in their networks in order to handle explosive traffic growth and deliver an excellent customer experience. Competition is tough not only because of traditional challengers but because of over-the-top (OTT) players who are able to move very fast because they live in a software-based world. 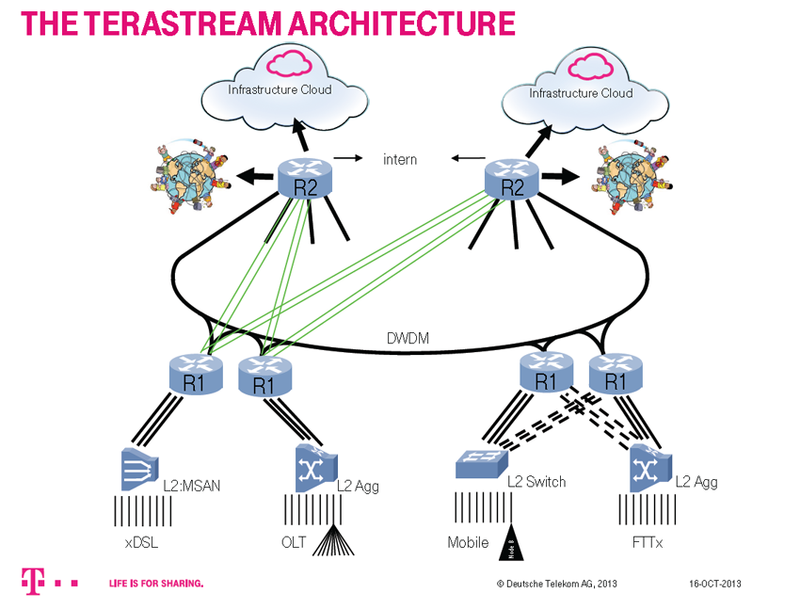 The Terastream architecture answers these challenges, said Clauberg, by providing a radical simplification of the infrastructure and eliminating legacy protocols. What should the network look like if all the traffic were IP? What is all of the equipment for delivering services could be centralized in an infrastructure cloud data center? Once the network operator has a data center that serves as an infrastructure cloud, it is easy to see how other network functions could be virtualized. Key enabling technologies for Terastream include 100G coherent optics, IP/DWDM, IPv6, a real-time OSS, KVM hypervisors, and OpenStack. IPv4 is only a service produced in the network. Clauberg said one early decision was to push for open standard solutions. The infrastructure cloud will be run on Layer 3 networking. There is a strong push to make everything fully automated and secure. Terastream has already been deployed in Croatia -- part of the DT global footprint -- as a proof-of-concept. The first rollout occurred in a matter of months. Over 500 customers are already getting up to Gigabit access speeds with native IPv6 service. 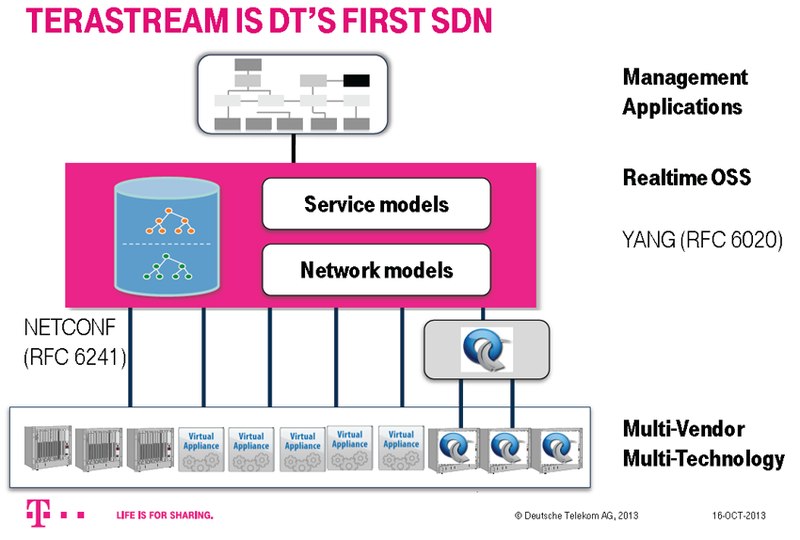 "We are on a path toward becoming a software-defined operator," said Clauberg. However, even though operators are moving from hardware to these software business models, his call to the industry is to keep innovating in both domains. A DT slide deck from last year. In September, Deutsche Telekom confirmed multi-vendor interoperability on a 100 Gigabit Ethernet long haul link on TeraStream pilot network in Croatia. The tests, which were a joint effort between Alcatel-Lucent, Cisco Systems, Hrvatski Telekom and Deutsche Telekom, represent an important milestone towards the future of generally available 100GbE networking. AT&T and Crown Castle announced a $4.85 billion deal under which AT&T will lease the rights to approximately 9,100 of its company-owned wireless towers to Crown Castle. The deal also includes the sale of approximately 600 AT&T towers to Crown Castle. Under the terms of the leases, Crown Castle will have exclusive rights to lease and operate approximately the towers, including the option to sublease to other carriers. The average term of the lease rights is about 28 years. As the leases expire, Crown Castle will have fixed price purchase options, totaling approximately $4.2 billion, for these towers based on their estimated fair market values at the end of the lease terms. AT&T will sublease capacity on the towers from Crown Castle for a minimum of 10 years for $1,900 per month per site, with annual rent increases of 2 percent. AT&T has the option to renew up to a total of 50 years. AT&T will also have access to additional reserve capacity on the towers for future use. AT&T expects the additional capacity will help it continue to meet growing demand for mobile Internet services. The transaction will have no impact on the customer experience. In December 2012, Crown Castle purchased approximately 7,200 towers from T-Mobile USA for $2.4 billion in cash. 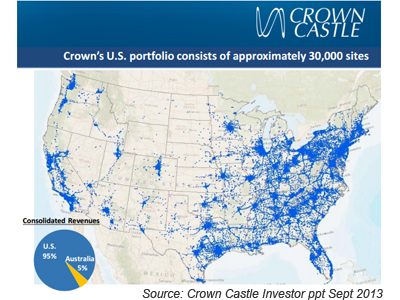 Also in 2012, Crown Castle International acquired NextG Networks for approximately $1.0 billion in cash. NextG, which specialized in outdoor distributed antenna systems ("DAS"), had over 7,000 nodes-on-air and a further 1,500 nodes under construction. In addition, NextG had rights to over 4,600 miles of fiber. Over 90% of NextG nodes were in urban and suburban locations, with 80% in the top ten US metropolitan areas, including New York, Los Angeles, Chicago and Dallas Fort Worth.